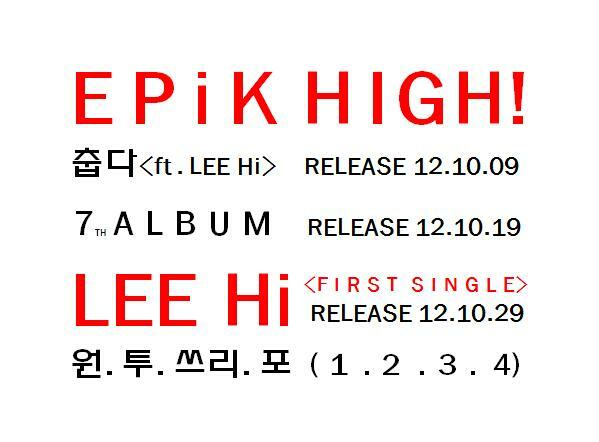 YG Entertainment hip-hop group Epik High will be releasing their 7th album on October 19. On October 9, Epik High will drop their first single ‘Cold’ featuring a fellow YG Entertainment artist Lee Hi. The full album (title yet to be announced) is expected to be released on October 19, 2012. This entry was posted in Album Release, Miscellaneous and tagged cold, DJ 투컷, dj tukutz, Epik High, 미쓰라 진, 타블로, 에픽하이, 이하이, 춥다, lee hi, mithra jin, Tablo, yg entertainment. Bookmark the permalink.